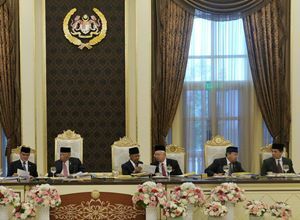 MESYUARAT MAJLIS RAJA-RAJA KE-238... SPB Yang Dipertuan Agong dan KDYMM Sultan Pahang kelihatan dipersembahkan taklimat ringkas mengenai hal-hal urusan mesyuarat oleh masing-masing Dato' Sri Mohd Najib dan Dato' Sri DiRaja Adnan. Yang turut kelihatan dalam foto ini ialah Sultan Selangor yang diiringi oleh Menteri Besarnya, Encik Azmin Ali. 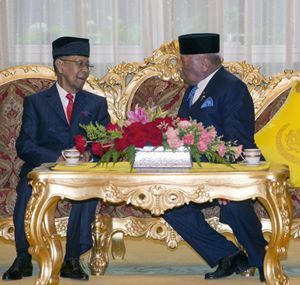 ISTANA NEGARA, KUALA LUMPUR – SPB Yang Dipertuan Agong, Tuanku Abdul Halim Mu'adzam Shah hari ini, Khamis, 11 Jun berkenan berangkat hadir pada Mesyuarat Ke-238 Majlis Raja-Raja, yang berlangsung untuk hari kedua di sini. Mesyuarat itu yang bermula semalam, Rabu, 10 Jun, dipengerusikan oleh KDYMM Sultan Pahang. Yang turut berangkat hadir ialah kesemua Raja Melayu kecuali Terengganu yang diwakili oleh Tengku Sri Temenggong, Raja Tengku Baharuddin Ibni Almarhum Sultan Mahmud; dan Johor diwakili oleh Tunku Temenggong Johor, Tunku Idris Sultan Ibrahim. Kesemua Yang Dipertua Negeri turut hadir pada mesyuarat tersebut. Perdana Menteri Dato’ Sri Mohd Najib Abdul Razak telah mengiringi SPB Yang Dipertuan Agong manakala Menteri Besar Dato’ Sri DiRaja Adnan Yaakob mengiringi KDYMM Sultan Pahang. Raja-Raja Melayu lain diiringi oleh Menteri Besar masing-masing kecuali Perak yang diwakili oleh Ahli Exco Kerajaan Negeri, Dato’ Saarani Mohamad. Yang Dipertua Negeri-Yang Dipertua Negeri Melaka, Pulau Pinang, Sabah dan Sarawak diiringi oleh Ketua Menteri masing-masing. An average of RM2 billion worth of investment 'pours' into Pahang annually! … testimony to the success of the ‘people- and investor-friendly’ approach applied by Dato’ Sri DiRaja Adnan since helming the state in 1999. “… we are damn bloody serious about this,” he warned, with regards to the many strict regulations that the State Government have recently introduced to tackle the menacing mining and transportation of iron ore and bauxite. SHOVING IN TANDEM... Dato' Sri DiRaja Adnan, joint on stage by - seen here, left to right, Encik Narayan, Encik Mohd Arif, Tan Sri Mohd Sidek, and, Dato' Mohd Roslan; are shoving the soils together to signify the ground breaking ceremony is officiated. BASF-PETRONAS PLANT, GEBENG INDUSTRIAL AREA, KUANTAN – Pahang has now attracted an average investment worth RM2 billion annually as proudly announced at a function here this morning. This is clear testimony to the continuous and successful application of the ‘people- and investor-friendly’ approach that Dato’ Sri DiRaja Adnan undertook since spearheading the State Government as the Chief Minister in 1999. “When I took over, with the grace of Allah the Almighty – as the Chief Minister in 1999, I did say that the State Government under my stewardship, will emphasise on two things. Number 1 to be ‘people-friendly’, and Number 2, to be ‘business-friendly’. “Because, I am fully aware that, without economic activities (by being ‘business- or ‘investor-friendly’), Pahang will not be a good place for the people to live in,” Dato’ Sri DiRaja Adnan said on Thursday morning, June 4 at the ground breaking ceremony of the 2-Ethylhexanoic Acid (2-EHAcid) Plant. Apart from the RM2 billion figure, Dato’ Sri DiRaja Adnan also mentioned a figure of RM20 billion that is about to flow into Pahang within this three-year period between 2013 and at the end of this year (2015). With these steady inflow of investments, he added, also proves that the State Government has succeeded in projecting the state as as a very conducive place for investors – be they local or foreign, to invest in. “… when the investments do come, Pahang State Government can say to the people that ‘there you are, at least there will be opportunities for you all either to be employed or to take part in the other fields of economic activities’,” Dato’ Sri DiRaja Adnan said. He added that the State Government always welcome the coming in of investments into the state as with these created many spin-off effects that benefited not only the state but more importantly, the people in general. “You (just) can’t imagine the State of Pahang especially Kuantan, without this Gebeng Industrial Area that has so far provided 12,000 employment opportunities to the people of Pahang. “12,000 (employees) X 4 – that’s the number of dependant of one employee; that comes to about 48,000 (people). Thus, the Gebeng Industrial Area alone provides ‘bread and butter’ for at least 48,000 people in Kuantan,” he added. IN THE DRIVER'S SEAT, SINCE 1999... Dato' Sri DiRaja Adnan behind the rostrum, delivering his 12-minute off-the-cuff speech, among others recalling his very first media statement after assuming the Chief Ministership on May 25, 1999 of his administration's 'people- and investor-friendly' approach. He also said that he for one, do not believe so much on those economic indicators such as unemployment rate and per kapita income; to signify the whole economic situation of a particular state or country. “What is important is the things that you can see. If you go to Kuantan, you can see the various hive of activities – the coffeehouses (are patronized daily), hotels are fully booked… All are very active which shows that, the economic situation is fairly good,” he insisted. In his 12-minute off-the-cuff speech, Dato’ Sri DiRaja Adnan also highlighted the State Government’s not-so-happy encounter with the menacing mining and transportation operators of iron ore and bauxite especially in this district of Kuantan. “I specifically took charge and chaired two (2) meetings – one in January, one in April and after that, last week, we had another meeting,” he said. “Now we are damn bloody serious about this, to contain this problem. And, we have come out with a list of regulations that need to be followed. In three weeks time, you can see some improvements. THE HIGHLY ATTENTIVE AUDIENCE... The bigwigs and officials of Petronas and BASF-Petronas are giving full attention to what being delivered by the Chief Minister. “And hopefully after 31st August, there will be no more illegal mining activities and also to see changes in the attitude of some of the transport operators (of these minerals),” he assured . A team especially from the state’s Pejabat Pengarah Tanah dan Galian (PTG) he added, will go to the existing illegal mining areas to seal off the area and also machineries that involve in the illegal activities. Senior Vice President, BASF Intermediates Asia Pacific, Encik Narayan Krishnamohan; Managing Director, BASF-Petronas Chemicals, Dr Stefan Beckmann; and, Operations Director, BASF-Petronas Chemicals, Encik Domien Esbroeck.